In this week’s study from Tehillim / Psalms 64:1-10, the psalm opens saying, א לַמְנַצֵּחַ מִזְמוֹר לְדָוִד: For the choir director. A Psalm of David. David begins asking the Lord to hear him, ב שְׁמַע אֱלֹהִים קוֹלִי בְשִֹיחִי מִפַּחַד אוֹיֵב תִּצֹּר חַיָּי: 64:1 Hear my voice, O God, in my complaint; Preserve my life from dread of the enemy. (NASB) Why does he ask the Lord to preserve his life from the “dread” of the enemy? He continues saying, ג תַּסְתִּירֵנִי מִסּוֹד מְרֵעִים מֵרִגְשַׁת פֹּעֲלֵי אָוֶן: ד אֲשֶׁר שָׁנְנוּ כַחֶרֶב לְשׁוֹנָם דָּרְכוּ חִצָּם דָּבָר מָר: ה לִירוֹת בַּמִּסְתָּרִים תָּם פִּתְאֹם יֹרֻהוּ וְלֹא יִירָאוּ: 64:2 Hide me from the secret counsel of evildoers, From the tumult of those who do iniquity, 64:3 Who have sharpened their tongue like a sword. They aimed bitter speech as their arrow, 64:4 To shoot from concealment at the blameless; Suddenly they shoot at him, and do not fear. (NASB) Here David understands the tongue to be synonymous to the sword capable of striking and cutting deep, not so much as to cut the flesh, but to cut deep down to the soul. He continues describing the wicked in the following way, ו יְחַזְּקוּ-לָמוֹ | דָּבָר רָע יְסַפְּרוּ לִטְמוֹן מוֹקְשִׁים אָמְרוּ מִי יִרְאֶה-לָּמוֹ: 64:5 They hold fast to themselves an evil purpose; They talk of laying snares secretly; They say, ‘Who can see them?’ (NASB) The ungodly man in the secret place of his heart devises evil towards his fellow man. David describes these evil plans as, ז יַחְפְּשֹוּ עוֹלֹת תַּמְנוּ חֵפֶשֹ מְחֻפָּשֹ וְקֶרֶב אִישׁ וְלֵב עָמֹק: 64:6 They devise injustices, saying, ‘We are ready with a well-conceived plot’; For the inward thought and the heart of a man are deep. (NASB) The plans that are conceived are “injustices,” as compared to God’s ways which are done in righteousness, holiness, truth, and justice. David believes the Lord will save him from the hidden plans of the enemy saying, ח וַיֹּרֵם אֱלֹהִים חֵץ פִּתְאוֹם הָיוּ מַכּוֹתָם: 64:7 But God will shoot at them with an arrow; Suddenly they will be wounded. (NASB) In their evil ways, even their own tongues will work against them, and this appears to be the work of God. ט וַיַּכְשִׁילֻהוּ עָלֵימוֹ לְשׁוֹנָם יִתְנוֹדֲדוּ כָּל-רֹאֵה בָם: י וַיִּירְאוּ כָּל-אָדָם וַיַּגִּידוּ פֹּעַל אֱלֹהִים וּמַעֲשֵֹהוּ הִשְֹכִּילוּ: 64:8 So they will make him stumble; Their own tongue is against them; All who see them will shake the head. 64:9 Then all men will fear, And they will declare the work of God, And will consider what He has done. (NASB) David concludes his psalm bringing glory to the Lord in the statement of faith saying, יא יִשְֹמַח צַדִּיק בַּיהֹוָה וְחָסָה בוֹ וְיִתְהַלְלוּ כָּל-יִשְׁרֵי-לֵב: 64:10 The righteous man will be glad in the Lord and will take refuge in Him; And all the upright in heart will glory. (LXX) Indeed what a wonderful God we serve! David begins his psalm asking the Lord to hear him, ב שְׁמַע אֱלֹהִים קוֹלִי בְשִֹיחִי מִפַּחַד אוֹיֵב תִּצֹּר חַיָּי: 64:1 Hear my voice, O God, in my complaint; Preserve my life from dread of the enemy. (NASB) Why does he ask the Lord to preserve his life from the “dread” of the enemy? What is the meaning of the “dread of the enemy?” The Aramaic Targum states, ב שמע אלהא קלי בעידן צלותי מדלוחא דבעיל דבבי תנטור חיי׃ 64:2 Hear my voice, O God, in the time of my prayer; guard my life from the fear of the enemy. (NASB) The Septuagint states, 64:1 … εἰσάκουσον ὁ θεός τῆς φωνῆς μου ἐν τῷ δέεσθαί με ἀπὸ φόβου ἐχθροῦ ἐξελοῦ τὴν ψυχήν μου 64:1 Hear my prayer, O God, when I make my petition to thee; deliver my soul from fear of the enemy. (LXX) In both the Aramaic and Septuagint, the word “dread” (מִפַּחַד) is translated as “fear” (מדלוחא). David asks the Lord in the MT to hear the “complaint” (בְשִֹיחִי) he is voicing. The word translated “complaint” is שִׂיחַ meaning “meditation, prayer, talking, communication, babbling, and complaint.” It is important to note that David’s “complaint” is not against the Lord and how He is handling things, but rather, a “complaint” about his enemies. This is something that he is bringing to the Lord and not against the Lord. There is a significant difference here in the mode in which he is bringing his complaint. David goes on to seek the Lord for deliverance from the dread or fear of his enemies. This kind of dread or fear seems to be a description of his worrying about what is going to happen in his life. David is fretting over and worrying about his enemies constantly. By fretting or worrying in this way, it is possible to exhaust one’s faith and belief that the Lord God is going to bring a positive outcome. This kind of worrying can have a draining effect on life and faith. Here David is showing us how he seeks the Lord for wisdom and the power to stand against this kind of fear. The dictionary defines “dread” as, “fear,” “anxiety,” and “uneasiness.” We are told not to be afraid, anxious, or in fear according to the apostolic Writings. Both Yeshua and the Apostles wrote that our fear should be directed to a fear of the Lord rather than to our own lives since the Lord God is in control of all things, therefore do not be afraid, do not fear (Luke 12:4, Acts 18:9, 1 Peter 3:14). Yeshua and the disciples taught this principle. The Lord equips us to overcome fear in our lives by the power of His Holy Spirit. Fear robs us of the joy and peace that we are supposed to live in regardless of the circumstances. Yeshua said in Luke 12:4-5 to fear the Lord God, our Father in heaven, who is able to cast one into Hell, rather than to fear those who can harm the body. The idea is that the Lord has the power over both the body and the spirit of a man, whereas on this earth, the enemy has only the power to destroy the body. The Lord promised Paul to be protected in the city he was staying in, and his teaching about the Messiah led to Crispus, the leader of the synagogue, believing in Yeshua as the Messiah. Acts 18:8 states that Crispus and all his house believed and performed a mikva (baptized). Peter encourages to remain faithful in the midst of suffering for righteousness sake, and not to fear intimidation, do not be troubled. These texts from the Apostolic Writings, and David’s Psalm are reminiscent of Moshe’s words from Parashat Vayelech just prior to Israel entering the Promised Land, Moshe told the people not to fear. In the Greek language, the word kingdom (βασιλεία Basileia) appears 162 times in the Apostolic Writings, most of these uses relate to either Basileia tou Theou (βασιλεία τοῦ θεοῦ), meaning “Kingdom of God” or to Basileia tōn Ouranōn, (Βασιλεία τῶν Ουρανῶν) meaning “Kingdom of Heaven.” The words Kingdom of Heaven (Basileia tōn Ouranōn) appears 32 times in the book of Matthew and nowhere else in the Apostolic Writings. Matthew also uses the term Kingdom of God (Basileia tou Theou) in a number of cases, and his usage is considered interchangeable with “Kingdom of Heaven” (Basileia tōn Ouranōn). An interesting concept regarding the phrase “Kingdom of Heaven,” is in Judaism’s restriction on the use of the Name of God and the frequent use of the word “God,” Elohim. It is highly likely that Matthew used the term Heaven due to the fact that Judaism imposed restrictions on the frequent use of the name of God where he himself (Matthew) followed the rabbinic teaching on the matter. In addition, Yeshua never used the Name of God (YHVH) in his teachings. This is another indication of Yeshua’s compliance with Judaism’s teaching on the sacredness of the Name of God and preserving the holiness of the Name and thereby preserving the holiness and sacredness of the Lord God in heaven. The Tanach describes God as “the Judge of all” with the idea that all of mankind will eventually “be judged.” This is an essential element of the Apostolic Writings and the teachings of both Yeshua and the disciples. From the perspective of the Tanach, and from Judaism, within the Second Temple period, the people were looking for the restoration of Israel to the Davidic Kingdom. The concept of the coming of the kingdom of God brought with it the direct involvement of God taking and delivering Israel from the rule of pagan Empires that ruled the nations. The midrashim both for Tehillim and Midrash Rabbah contain Jewish sources that imagine the restoration of Israel and the destruction of the nations and/or the gathering of the nations to obedience to the One True God and to worship at His holy hill (Zion). Yeshua’s teachings appear to stand firmly in this tradition (interpretation), and with the coming of the “Son of Man” taken from a prophetic perspective (Daniel 7), Yeshua suggests that this process has begun in Him (Yeshua). Yeshua’s suffering death seemed to cast doubt on Yeshua’s teachings about himself, but his resurrection established his claim and clarified the interpretation of the Scriptures according to the Torah, Neviim, and Ketuvim (Tanach). Based upon this understanding of the Scriptures, our calling is to set our hands at work for God’s kingdom. Any interpretation or use of the phrase, “the Kingdom of God,” needs to be understood from this Jewish perspective and historical framework. The interpretations must be consistent with the Jewish hope of a Messiah, and this is David’s understanding in his request seeking the Lord to hear his prayer, to listen to his complaint, and seeking the Lord God in heaven for help. 64:3 You will hide me from the secret [council] of those who do evil, from the turmoil of those who practice deceit. 64:4 Who have sharpened their tongue as a sword, bent their bows, smeared their arrows with deadly and bitter poison. 64:5 To shoot in secret, without blame; suddenly they will shoot him and they will not fear. 64:2 Thou hast sheltered me from the conspiracy of them that do wickedly; from the multitude of them that work iniquity; 64:3 who have sharpened their tongues as a sword; they have bent their bow maliciously; 64:4 to shoot in secret at the blameless; they will shoot him suddenly, and will not fear. The Aramaic Targum states that in David’s request of God, he seeks the Lord to hide him from the secret council of those who do evil. What is the secret council of those who do evil? He says that those who take council in secret are those who practice deceit. Those who do this seek to encourage themselves in an evil matter. The secret place is a reference to one’s heart, the inward thoughts that are full of evil and sin. The judgment of God will come upon those who secretly conceive to do evil and who deceive themselves in their own hearts. This reminds us of the prophet Jeremiah’s words in Jeremiah 23:15-20. Jeremiah speaks of walking in the stubbornness of one’s heart that is due to despising the Lord God in heaven and despising His commands. The stubbornness of the heart, the evil heart, of the wicked is paralleled to the righteous who stand in the council of the Lord. The council of the Lord is to see and hear His word, the Scriptures. But not only this, the one who seeks and hears also gives heed and listens meaning that one obeys. Remember in Parashat Ki Tavo (Devarim / Deuteronomy 26:1-29:8), Moshe lists the blessing that follows the one who listens and obeys (השמעים והשמרים) God’s Word and the curse that follows when one chooses not to listen and obey. Devarim / Deuteronomy 28:1 states וְהָיָה אִם-שָׁמוֹעַ תִּשְׁמַע בְּקוֹל יְהוָֹה אֱלֹהֶיךָ לִשְׁמֹר לַעֲשֹוֹת saying “now it comes to be that you listen hearing the voice of the Lord God to keep and to do …” Note how the phrase שָׁמוֹעַ תִּשְׁמַע is translated as “diligently obey” according to the NASB. The first word שָׁמוֹעַ is a 3rd—ע Qal noun meaning “to hear or to listen” and תִּשְׁמַע is written in the imperfect Qal second person masculine singular form denoting a past action that is in progress but not completed at the time in question. This Hebrew phrase is translated in English as to “diligently obey” the Lord your God. It is interesting that, the verse says “if you listen to the voice of the Lord your God” (וְהָיָה אִם-שָׁמוֹעַ תִּשְׁמַע בְּקוֹל יְהוָֹה אֱלֹהֶיךָ לִשְׁמֹר לַעֲשֹוֹת) in Hebrew, the imperfect form indicates that listening is an ongoing process that is not yet complete. This suggests the process of listening (hearing) and obeying God’s voice is an ongoing, daily, life long process. A parallel is drawn within the sentence on “listening or hearing the voice of the Lord God” and “to keep” (לִשְׁמֹר) and “to do” (לַעֲשֹוֹת) what God has commanded. This is the Torah context for the book of Jeremiah. This is the Torah context for David’s words in the Psalm. The ungodly seek the secret council of their hearts rather than the open council of God in His Word. Based on Tehillim / Psalms 64:2-4, David understands the tongue to be synonymous to the sword capable of striking and cutting deep, not so much as to cut the flesh, but to cut deep down to the soul. They desire to shoot in secret so that no one sees their actions, and their thought is that if no one sees, they are without blame (64:5 To shoot in secret, without blame; suddenly they will shoot him and they will not fear. EMC) The idea is that if nobody sees the thoughts in their hearts, they do not fear. The point is that we should be very concerned with the thoughts of our hearts, because the Lord God in heaven sees the thoughts of our hearts. In addition, the rabbis interpret the intent of the heart as being synonymous to having performed the act of sin and being guilty of sin. Yeshua also taught this according to Matthew chapter 5 and lusting for a woman and hating your brother. Lusting for a woman, one has already committed adultery, and hating your brother, one has already committed murder. We should seek the Lord as David is seeking the Lord to purify our hearts, and to motivate our hearts to study His word for the purpose of the washing of the water of the word (Ephesians 5:26) to cleans us and our hearts. The Word of God has the function of wiping clean the junk that we put into our hearts. The junk that we put in has the capacity to lead us to sin. Similarly, the light of God’s word that we place in our hearts through study, has the capacity to lead us to live a life of holiness and righteousness, with the help of God! David points out that 94:7 They have said, ‘The Lord does not see, Nor does the God of Jacob pay heed.’ (NASB) The abuse and misuse of the widow, the stranger, the orphan, comes by the person who does not believe in truth, justice, mercy, and righteousness and does not believe God sees or cares. David says however the Lord God does hear, the proof is the Lord created the ear and the eye, the Lord is the one who gives man knowledge. The idea here is that as a man grows and learns, it is the Lord God who enables the man to learn. Learning is not simply a work of our own hands. An important point to take note of is when one wants to learn and is studying, ask the Lord to help because these Scriptures say it is the Lord God in heaven who teaches a man knowledge. The description David gives in Tehillim / Psalms 94, of the wicked, their affliction, their arrogance, how they crush God’s people, and deal deceitfully with man, even their own brothers, this is very similar to the way David is describing the ungodly in Tehillim / Psalms 64. David describes the evil plans of the wicked as, ז יַחְפְּשֹוּ עוֹלֹת תַּמְנוּ חֵפֶשֹ מְחֻפָּשֹ וְקֶרֶב אִישׁ וְלֵב עָמֹק: 64:6 They devise injustices, saying, ‘We are ready with a well-conceived plot’; For the inward thought and the heart of a man are deep. (NASB) The plans that are conceived are “injustices,” as compared to God’s ways which are done in righteousness, holiness, truth, and justice. The Aramaic Targum states, ז יבלשון למשכח עילין לשיצאה זכאין בלושא דמתבליש בגוף בר נשא והירהורי ליבא עמיקא׃ 64:7 They will search to find pretexts to destroy the pure, a search carried out in the body of a son of man, and the thoughts of a secret heart. (EMC) and the Septuagint states, 64:6 ἐξηρεύνησαν ἀνομίας ἐξέλιπον ἐξερευνῶντες ἐξερευνήσει προσελεύσεται ἄνθρωπος καὶ καρδία βαθεῖα 4:6 They have searched out iniquity; they have wearied themselves with searching diligently, a man shall approach and the heart is deep, (LXX) Note how the Aramaic Targum states that the wicked will search to find pretexts in order to destroy the poor. What does it mean to search for pretexts? A pretext is an excuse to do something or say something that is not accurate. Pretexts may be based on a half-truth or a person may develop a context (a story, a fabrication) for the purpose of misleading. Pretexts have been used to conceal the true purpose or rationale behind actions and words. In the case of the wicked from this Psalm perspective, the pretext is used to hide the hidden desire to do injustice to another. In US law, a pretext describes false reasons that hide the true intentions or motivations for a legal action. For example, a “pretextual” arrest by law enforcement officers is one carried out for illegal purposes such as to conduct an unjustified search and seizure. The rabbis, translating the Masoretic text into Aramaic, speak of the pretext in the sense that the wicked do such within the body, within the thoughts of a “secret” heart. The idea of a secret heart suggests that there are those who do not have a secret heart, those whose hearts are open for all to see in their good deeds. The Septuagint states that the wicked search out iniquity and they do so much so that their weary themselves in their schemes and plans of unrighteousness. Notice how the Lord God goes ahead of Israel to destroy the nations before them. This is synonymous to the words David is saying in the Psalm. The Lord will go before us if we are moving about in life with pure motivations and with a pure heart. Note that there are many Torah concepts found within the Psalms. For example, the Torah speaks of uncleanness, both spiritually and physically, protection from death, and protection by innocent blood. David is applying the concept of the Lord going before His people for their protection. In Tehillim / Psalms 51, David asks to be cleansed from sin by the phrase תְּחַטְּאֵנִי בְאֵזוֹב וְאֶטְהָר which translates literally as “my sins in hyssop and I will be clean.” Based on the way he worded his psalm, he is asking the Lord to cleans him both inwardly and outwardly. David desires not only that his sins be forgiven him but that his heart would be made pure in Tehillim / Psalms 51:12-13, יב לֵב טָהוֹר בְּרָא-לִי אֱלֹהִים וְרוּחַ נָכוֹן חַדֵּשׁ בְּקִרְבִּי: יג אַל-תַּשְׁלִיכֵנִי מִלְּפָנֶיךָ וְרוּחַ קָדְשְׁךָ אַל-תִּקַּח מִמֶּנִּי: “Create in me a clean heart, O God, And renew a steadfast spirit within me. Do not cast me away from Your presence And do not take Your Holy Spirit from me.” (NASB) David asks the Lord to literally, “return to me” (הָשִׁיבָה לִּי) which provides for us the idea of the Lord God “returning” to David. This is reminiscent of having a repentant attitude, the turning from sin, returning to the Way of the Lord, etc. Isn’t it interesting how all of these requests suggest that the Lord is the one who is doing these things on David’s behalf, even helping him to have a sustained spirit within (וְרוּחַ נְדִיבָה תִסְמְכֵנִי) or to “uphold” his spirit within. It may be in this way David is understanding God’s role in his life, just as Moshe said in Parashat Vayelech that the Lord is going before Israel into the land to defeat the nations for them. The Psalms suggest the Lord’s role in our lives is to keep us willing, to create in us a willing spirit to be obedient and not sin, and it is by the power of His Holy Spirit that enables us to be successful in our daily lives. This should be our prayer today that the Lord would help us to live obedient lives. And then we can stand beside David and say as he said in Tehillim / Psalms 64:10 The righteous man will be glad in the Lord and will take refuge in Him; And all the upright in heart will glory. (NASB) Let’s Pray! 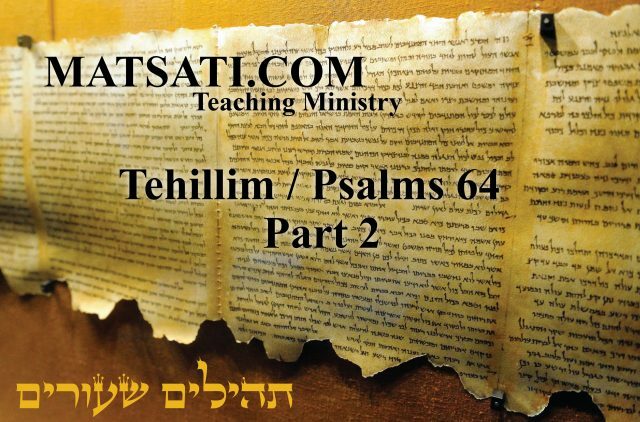 The Rabbinic Commentary (Midrash) on Tehillim / Psalms 64 has 1 part. Reading through the Midrash we will be looking at Part 1. Let’s begin by outlining Midrash Tehillim Chapter 64, Part 1. Outline of Midrash Tehillim / Psalms, Chapter 64, Part 1. The משל (mashal) “the parable,” goes on to explain the פתיחתא (Petihta), the rabbis comment upon David’s words saying that the Lord showed David what would happen to Daniel. The midrash continues with examples of how this was so in Daniel’s life. The נמשל (Nimshal) “expansion on the parable” expands upon the משל (mashal), the rabbis expand upon the mashal by contrasting what happened to Daniel, the lion’s den, the king, and those who were cast into the lion’s den following Daniel’s deliverance. Midrash Tehillim 64, Part 1 opens with the Dibur Hamathil (דיבור המתחיל) saying “For the leader. A Psalm of David, Hear my voice, O God, in my prayer; preserve my life from fear of the enemy (Tehillim / Psalms 64:1-2)” The rabbis open looking at David’s calling out to the Lord to hear his prayer and to preserve his life. The homiletic introduction to the midrash states, “These words are to be read in the light of what Scripture says elsewhere, Surely the Lord God will do nothing, but He reveals His secret unto His servants the prophets (Amos 3:7).” (זהו שאמר הכתוב כי לא יעשה (ה׳) [אדני אלהים] דבר כי אם גלה סודו אל עבדיו הנביאים (עמוס ג ז)) The rabbis say the Lord will surely do nothing? Why do they say that God will do nothing? Could this be related to the question of “why does God allow bad things to happen to good people,” and the consequences that fall upon our choices in life? The Torah tells us, “God created man in His image, in the image of God He created him” (Bereshit / Genesis 1:27). How are we to understand what it means to be created in God’s image? Man is finite and corporal so how are we created in God’s image? The “image of God” that is described in the Scriptures may be dealing with the non-physical part of us, the spirit and the soul. The example of this may be related to our desire for morality and meaning in life. Our desire to make a difference may be derived from the soul which is made in the “image of God.” By this image, we are given the ability to make independent choices, such as that of moral character. In addition, the one thing that sets us apart from the rest of creation is our ability to create new things and to improve our living conditions. The concept of “choice” is most important here because it is our ability to choose that makes life meaningful for each of us. An example is found in the difference in being “programmed to love” versus the choice to love. The difference between these types of love is what makes love significant. Similarly, if I don’t have the choice to do maasim tovim (to do good), but am programmed to do good, then there’s nothing meaningful about doing good. Whereas if I have the ability to do both good and evil, then the concept of “good” becomes significant. The message here goes deeper, because our choices have consequences. For example, if every time I get in trouble, my dad comes to bail me out, that’s not real choice. Choice brings with it consequences. Throughout history, from a national perspective, down to the individual, consequences follow from our choices. For example, in Parashat Devarim, the people’s fear leads to a failure to trust God. As a result they rebel against God’s plan for them to enter the land he promised to Abraham, Isaac and Jacob (Devarim / Deuteronomy 1:7-8). The Lord had brought Israel out of slavery in Egypt, given them His Torah on Mt. Horeb (Sinai), and brought the people swiftly to the borders of the promised land (Devarim / Deuteronomy 1:19-20). Moshe then announces it is time to enter the land, but the people are fearful of the Amorites who occupy the borders. Their choice to fear the Amorites rather than God, and lack of trust in God led to their spending an additional 40 years in the wilderness and dying in the wilderness. Could our fear and lack of trusting in the Lord lead to the Lord not doing anything? Is this a challenge in life that was given to me so I could become an example to inspire others? Is this to get me to fix a wrong I’ve done? Is this due to historical or national consequences that are affecting me as an individual? Is what’s happening to me now the result of a choice that I’ve made in the past? Am I on my own because I have distanced myself from the Lord through sin? These are all very important questions that need to be worked on a person by person basis. This question of why bad things happen may be the reason why the Rabbis open with the comment based on David’s cry to the Lord to hear his prayer and to preserve his life from his enemies. The rabbis quote from Amos 3:6-8 which states, 3:6 If a trumpet is blown in a city will not the people tremble? If a calamity occurs in a city has not the Lord done it? 3:7 Surely the Lord God does nothing Unless He reveals His secret counsel To His servants the prophets. 3:8 A lion has roared! Who will not fear? The Lord God has spoken! Who can but prophesy? (NASB) The Scriptures say the Lord reveals to His prophets the reasons trouble comes. The midrash continues by drawing a parallel between David and Daniel, saying that the Lord made known to David what he would do to Daniel. The concept here is that if the heathen, the ungodly, the unrighteous, the wicked, had the power to do anything to the Lord God in heaven, they would have done it. If they could have broken into heaven, they would have done so. But since they do not have the ability to do these things to the Lord God in heaven, they do these things to God’s servants, and this may be the reason why the rabbis say God reveals (makes known) to David what would happen to Daniel. This statement in the midrash alludes to the rabbinic thought that David was also a prophet. The comparison here is regarding the anointed one, David is the anointed one of God, and Daniel was also the anointed one of God. The rabbis maintain that the Scriptures speak of the Lord God bringing His anointed one to deliver Israel. In both of these instances, David and Daniel function as a deliverer for God’s people. The idea behind the story of Daniel was that nobody was to pray to any god besides to king Darius for 30 days. This may have been an attempt to wipe out the Jewish people in exhile in Babylon. The rabbis also the believe that the Lord God has kept an anointed one for each generation, and presently the anointed one (the messiah) is hidden. The point is that the Lord God provides for His people a deliverer, and according to the Midrash, the wicked are opposed to the Lord God in heaven, and His ways, and hold such strong opposition to God’s ways that they would break into heaven if it were possible. The midrash states the wicked, not being capable of breaking into heaven, they instead attack God’s anointed one, and His people. The presidents and the satraps said to Darius, Are you not a king to do just such? All kings establish statutes and make laws, as it is said according to the law of the Medes and Persians (Daniel 6:9). But in your life time, you have not established any statute. The king, hearing them say, Now, O King, establish the interdict and sign the writing, gave in to them and King Darius signed the writing and the interdict (Daniel 6:9-10). And when Daniel knew that the writing was signed, he went into his house; his windows being open in his chamber toward Jerusalem, he kneeled upon his knees three times a day, and prayed (Daniel 6:11) saying, Hear my voice, O God, in my prayer; preserve my life from the terror of the enemy (Tehillim / Psalms 64:1). When they sought out Daniel, they found him as he stood praying, as it is said Then these men came tumultuously, and found Daniel praying and making supplication before his God (Daniel 6:12). Whereupon, Daniel uttered the following words before God, These men come tumultuously upon me, Hide me from the council of the evil doers; from the tumult of the workers of iniquity (Tehillim / Psalms 64:3). The rabbis recount the story of king Darius establishing a law forcing everyone in his kingdom to worship the image he built. Daniel maintained praying to the Lord God in heaven rather than Darius’ image. The men inspired the king to establish this law and then laid in wait for Daniel to disobey the Law and sought to have him killed. The Midrash states that “Daniel praying and making supplication before his God (Daniel 6:12). Whereupon, Daniel uttered the following words before God, These men come tumultuously upon me, Hide me from the council of the evil doers; from the tumult of the workers of iniquity (Tehillim / Psalms 64:3).” The rabbis are saying that David prophetically recorded the words that Daniel would say at a future time. Daniel is understood as being anointed of God. Anointed, in the plural, “my anointed ones” in the midrash may refer to the patriarchs. However, the patriarchs were never anointed with oil, like priests, prophets, and kings in later times. David speaks of the anointed ones (plural) according to Tehillim / Psalms 105. Here the term בִמְשִׁיחָי “My anointed ones” is a reference to the Lord’s prophets (וְלִנְבִיאַי). Note that the Anointed ones are also applied to the covenant people as a whole according to Tehillim / Psalm 89:38 and 89:51. The concept put forward here in the midrash, is that Daniel feared the Lord God in heaven more than the courts of men and their legal ruling. Daniel realized that compromising with temporal powers can never lead to redemption. Generally speaking, compromise leads to falling away from God’s Mitzvot. For example, most “Believers” today have accepted the unrighteous code of Law makers, instead of insisting that the Law makers follow God’s morality as described in His Torah. The kingdoms of this world use force, for there is no love in what they do. Whereas the kingdom of God uses the Torah and love is the keeping of the Torah (Romans 13:8). There is a big difference between these two types of actions. The apostle James said there is only one lawgiver (James 4:12) who is the Lord (Isaiah 33:22). According to the Scriptures, governments have historically led people to sin (see Daniel 3:4-6, 1 Kings 12:25:33, 14:21-24, 2 Kings 13:2, 17:21, 21:11,16, 2 Chronicles 21:6,11-13, Isaiah 9:16), just as we are seeing here in Daniel chapter 7. According to the Prophets, in 1 Samuel 8:4-20, the Lord God condemned Israel for wanting to be ruled like other nations, by a human king. When they chose to be ruled by a human leader, our Father in heaven considered that decision to be a rejection of Himself. The reason being, the people were choosing someone else to reign over them rather than God (1 Samuel 8:7, 10:19). Only later did the people realize their sin against the Lord when the man who was elected to govern them turned out to be unfaithful and disobedient to God’s command (1 Samuel 12:19). The major thrust of the Prophets was not in the creation of new laws, but in the return and observance of God’s Torah. Such is the case with Hezekiah and Josiah, it was a return to the ways of the Lord was made among them, God was pleased with their directing and requiring the judges, and other officers, to act according to the Torah. In addition, this is the thrust of the Apostolic Writings and the new covenant the Lord has made (Jeremiah 31) in the Messiah by writing His Torah on our hearts. In addition, the Scriptures tell us that to serve an earthly king, or his government, is to serve other gods (1 Samuel 8:8-9). This may have been the result of the nations who believed their rulers to be gods or the son of the gods as in the Egyptian religion and Pharaoh. The Scriptures describe following disobedient government as a form of disobedience (1 Samuel 12:17-19, 2 Kings 17:7-8). The Lord rejected those who followed the statutes of governments instead of His Commandments (2 Kings 17:19-20). The reason being, throughout the history of Israel, the majority of the kings of Israel did evil in the sight of the Lord (1 Kings 11:4-9, 2 Kings 8:18), showing us that the ruler who does not trust in the Lord results in governments that are corrupt. In the Apostolic Writings, the Jewish leaders, in similar historical fashion, chose king Caesar over the King Messiah Yeshua (John 19:15). Based upon the covenant agreement we have in Yeshua, and on all of Scripture, the duty of man is to live by God’s commandments (Ecclesiastes 12:13), and not man’s commandments which turn from the Truth (Mark 7:7, Colossians 2:20-22, Titus 1:14). The Apostle Paul said, the servant of the Messiah is to keep God’s Torah (Romans 13:8). When we pray, we pray to do our Father’s Will, not man’s will (Matthew 6:10, Luke 11:2). The Lord rewards those who place His Laws above man-made laws (Shemot / Exodus 1:17,20). We are even instructed to avoid going to courts of law before the unjust and unbelievers (1 Corinthians 6:1-8) mostly for the reason of the corruption in the courts. David expounded upon these things according to His Psalms, saying Tehillim / Psalms 1:1, “Blessed is the man that walks not in the counsel of the ungodly.” (NASB) The kings and rulers of the earth are against the Lord, and against his anointed (Tehillim / Psalm 2:2) where the wicked frame mischief and sin in their hearts. When a government is ungodly, and the people trust in that government, the Lord God will punish those whose trust is not in the Lord (Jeremiah 15:4, 46:25, 2 Kings 21:11-12, Isaiah 9:16, Ezekiel 11:10-12, Micah 6:13,16). The people will be cursed for trusting in man (Jeremiah 17:5, Hosea 10:13). It is better to trust in the Lord, than to put confidence in man and governments (Tehillim / Psalm 118:8-9). This is the whole point of the midrash on Daniel who feared the Lord God in heaven more than the courts of men and their legal ruling. The midrash looks at the Scriptures that speak of Daniel being cast into the den of lions and a stone being placed over the mouth of the den (Daniel 6:17-18, ז בֵּאדַיִן מַלְכָּא אֲמַר וְהַיְתִיו לְדָנִיֵּאל וּרְמוֹ לְגֻבָּא דִּי אַרְיָוָתָא עָנֵה מַלְכָּא וְאָמַר לְדָנִיֵּאל אֱלָהָךְ דִּי אַנְתְּה פָּלַח-לֵהּ בִּתְדִירָא הוּא יְשֵׁיזְבִנָּךְ: יח וְהֵיתָיִת אֶבֶן חֲדָה וְשֹֻמַת עַל-פֻּם גֻּבָּא וְחַתְמַהּ מַלְכָּא בְּעִזְקְתֵהּ וּבְעִזְקָת רַבְרְבָנוֹהִי דִּי לָא-תִשְׁנֵא צְבוּ בְּדָנִיֵּאל:) The question asked in the midrash is where are there stones in Babylon? The answer is that this stone flew from the land of Israel and came to rest at the mouth of the den. Why do the rabbis ask the question on the stone and why do they say this stone flew from Israel? Could this be a reference to the Lord being our rock according to Parashat Haazinu? The stones that save are the Lord God, being in the Land of Israel is connected to the stone, our Rock, our Redeemer, the Lord God Almighty? The Talmud Bavli Bekhorot 30 says the following concerning the stones. It is written (Gen. xxviii. ii), “And he took from the stones of the place;” and again it is written (ver. 18), “And he took the stone.” Rabbi Isaac says this teaches that all these stones gathered themselves together into one place, as if each were eager that the saint should lay his head upon it. It happened, as the Rabbis tell us, that all the stones were swallowed up by one another, and thus merged into one stone. The rabbis speak of stones miraculously moving together with a reference to Bereshit / Genesis 28:18, the stone that Jacob slept upon and then arranged into a pillar and anointed with oil. They taught that the stones moved together into one place being eager that a saint (a righteous man) would lay his head upon it. Could the midrashic interpretation of the stone that covered the lion’s den having flew from Israel, be taken from this context, the stone moving so Daniel, the righteous man, would lay his head upon the rock? Thinking on stones and rocks moving, we are reminded of Yeshua’s words from Matthew 17:20, 21:21, and Mark 11:23. Yeshua speaks of having faith and moving mountains. The midrash speaking of the stone that flew from Israel to cover the mouth of the lion’s den, its movement is miraculous, and this occurs by the power of God. It was by the power of God, Daniel survived the situation. The midrash goes on saying, “Rabbi Huna, in the name of rabbi Jose, interpreted the word stone as meaning that an angel, in the likeness of a lion, came and sat at the mouth of the den. And the proof? The verse My God has sent His angel, and has shut the lions’ mouths, and they have not hurt me (Daniel 6:23).” They are indeed thinking of the miraculous work of the Lord to deliver Daniel. The midrash recounts the king’s anguish over Daniel, and the next morning he comes and asks Daniel if the living God has saved him from the lion’s mouths, and the midrash states that though David heard the king, he did not reply because he was reading the Shema. Was he also given a Torah scroll and cast into the lion’s den? This again may be a reference to the heathen who rage against the Lord, against His Torah (His ways), and against His anointed one. Daniel then answers the king and says the Lord sent His angel to close the mouth of the lions. The men who accused Daniel were then brought and cast into the den, and they were consumed immediately. Midrash Tehillim 64, Part 1 concludes saying, “How many were cast into the den of lions? Mark what Scripture says, It pleased Darius to set over the kingdom a hundred and twenty satraps and over them three presidents, of whom Daniel was one (Daniel 6:2-3). Thus, there were one hundred and twenty two men, and one hundred and twenty two wives, and one hundred and twenty two children, for Scripture says, them, their children, and their wives, making three hundred four lions who tore each one into four pieces, one piece for every beast, the beasts tearing them apart even before they got down to the bottom of the den, as is said, They had not come to the bottom of the den; there were one thousand four hundred and sixty four lions. Hence, it is said, He that is righteous will be glad in the Lord, and will take refuge in Him; and all the upright in heart will glory (Tehillim / Psalms 64:11).” The Scriptures say Darius set 120 satraps over the provinces and appointed three men over these satraps, one of whom was Daniel. Notice how the midrash adds, הרי קכ״ב, וקכ״ב נשים, וקכ״ב בנים “122 men, 122 wives, and 122 children.” Why do the rabbis add two more men, wives, and children? Throughout the Psalms we find David expressing his total commitment and reliance in the Lord. Generations later, David’s descendant, Daniel, embodies this same character despite his power to interpret dreams, the authority that was given by Darius, and the challenges he faced each day trying to live a Torah observant life in the midst of Babylon. Daniel had been given all of these things and yet he did not become arrogant, he remained humble before the Lord. The addition of two more, may be the midrashic understanding of this psalm as prophetically referring to Daniel’s story and Darius the Mede taking over the rule and appointed 120 satraps to govern his country. These men were greedy and corrupt. Daniel was appointed as the head of all of them (along with 2 others). Some of these 120 satraps got together and tried to take Daniel down as they were jealous of him. Daniel was a righteous man who prayed three times daily, these men pressured Darius to decree that it was prohibited for one to pray to anyone other than Darius for the first 30 days of his reign. The satraps succeeded in having the king to make this decree into law, that any prayers recited not directly to the king would be punished by execution by being thrown into the lion’s pit. Daniel refused to stop praying to the living God and was “caught.” In addition, that this decree may have been a form of idolatry or individual persecution against Judaism in Babylon. Tehillim / Psalms 64:6-8 states, 64:6 They devise injustices, saying, ‘We are ready with a well-conceived plot’; For the inward thought and the heart of a man are deep. 64:7 But God will shoot at them with an arrow; Suddenly they will be wounded. 64:8 So they will make him stumble; Their own tongue is against them; All who see them will shake the head. (NASB) Ungodly men will stumble by their own words and actions because the Lord God is shooting them with arrows due to their sin and wickedness. When the satraps saw that Daniel was untouched by the lions, they may have argued to the king that Daniel was not touched by the lions because they must not be hungry. The king threw them into the den, and the Scriptures say they were devoured immediately. He ordered that they all be thrown into the den to test if the lions were indeed hungry. The midrash asks how many were cast into the den? The rabbis refer to all 120 satraps being cast into the den. The wicked stumbled and fell into their own trap, and died. When the people witnessed the great miracle of Daniel’s salvation and the downfall of his conspirators they were brought to awe before the Lord, whom Daniel credited with his salvation. King Darius sent out a decree publicizing the miracle and giving credit to the Great God of Daniel who saved him. He acknowledged the Lord as the living God, eternal and all-powerful. When we experience the miracles and kindness of the Lord in our own lives, we strive to share it with others and pass on the faith that we have and to encourage others in the same. Daniel followed in the footsteps of his great predecessors King David who used the psalms as a powerful tool for showing the mercies of God, and singing praises to His name. Let’s Pray! Previous articleBits of Torah Truths, Chol Hamoed Pesach, Are you Breaking the Covenant?